The Ukrainian Youth Association (UYA or "CYM" in Ukrainian) is an international, voluntary and non-profit organisation with branches throughout the United Kingom. Founded in Great Britain in 1948, after the arrival of Ukrainian emigrants. CYM has a long history of bringing Ukrainians together, organising events for them, installing Christian ethics, good behaviour, leadership qualities and promoting Ukrainian culture. 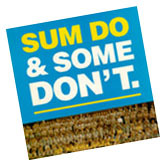 If you wish to know more about CYM, then please read our on-line brochure, 'SUM DO & SOME DONT'. This brochure is designed for those individuals wishing to join the Ukrainian Youth Assocition. The on-line guide will give a general guide to the activities and educational principles of CYM in Great Britain and across the world. Do you have any comments about the CYM GB web-site or wish to publish material on the CYM GB web-site ?